Moses then wrote down everything the Lord had said. He got up early the next morning and built an altar at the foot of the mountain and set up twelve stone pillars representing the twelve tribes of Israel. Then he sent young Israelite men, and they offered burnt offerings and sacrificed young bulls as fellowship offerings to the Lord. Moses took half of the blood and put it in bowls, and the other half he splashed against the altar. 1. NOW Moses called the multitude together, and told them that he was going from them unto mount Sinai to converse with God; to receive from him, and to bring back with him, a certain oracle; but he enjoined them to pitch their tents near the mountain, and prefer the habitation that was nearest to God, before one more remote. When he had said this, he ascended up to Mount Sinai, which is the highest of all the mountains that are in that country and is not only very difficult to be ascended by men, on account of its vast altitude, but because of the sharpness of its precipices also; nay, indeed, it cannot be looked at without pain of the eyes: and besides this, it was terrible and inaccessible, on account of the rumor that passed about, that God dwelt there. But the Hebrews removed their tents as Moses had bidden them, and took possession of the lowest parts of the mountain; and were elevated in their minds, in expectation that Moses would return from God with promises of the good things he had proposed to them. So they feasted and waited for their conductor, and kept themselves pure as in other respects, and not accompanying with their wives for three days, as he had before ordered them to do. And they prayed to God that he would favorably receive Moses in his conversing with him, and bestow some such gift upon them by which they might live well. They also lived more plentifully as to their diet; and put on their wives and children more ornamental and decent clothing than they usually wore. One of the last Pharaohs of the 13th Dynasty. He reigned for 11 years according to the Turin King List; longer than any other Pharaoh of that dynasty. There were a number of other Pharaohs in this Dynasty but they only reigned for very short periods. Neferhotep I was succeeded by his brother Sobekhotep IV rather than his son Haankhef (Wahneferhotep).He was probably the ‘Pharaoh of the Exodus’. The Pharaoh that refused to ‘let the Israelites go’. Moses (at the age of 80 years) and Aaron (aged 83 years) would have contronted Neferhotep in 1446BC which is when the Exodus occurred. Neferhotep I‘s mummy has never been found because he drowned in the Red Sea when pursuing the Israelites who were leaving Egypt (the Exodus). The semitic slave villages of Kahun and Tel ed-Daba were occupied up until the time of Neferhotep I. Scarabs of the 12th and 13th dynasty pharaohs from Sesostris II up until Neferhotep I were found by Flinders Petrie at Kahun indicating that it was Neferhotep I who was reigning when the Exodus occurred. These towns were suddenly evacuated near the end of the 13th dynasty. As the Exodus took place in 1446BC, the Dates of his reign are likely to be: 1457-1446BC (see Revised Chronology) Following Neferhotep I‘s death at the time of the Exodus, the Hyksos (Amalekites) were able to invade Egypt with very little resistance. Egypt’s wealth and power reached a peak during the reigns of Sesostris III and Amenemhet III of the 12th dynasty. Sesostris III and Amenemhet III had a coregency lasting about 20 years. It was during their co-regency that Moses was born to the Hebrew slave Jochebed (1526BC). Moses was born at a time when Amenemhet III was trying to kill the Hebrew babies to stop the Hebrews from outnumbering the Egyptians. Amenemhet III had no sons of his own and so he allowed his daughter Sobekneferu to adopt a little baby that she found left in basket among the bullrushes of the Nile. Moses was raised in Pharaoh’s household and would have become the next Pharaoh except he showed his allegiance to the Hebrews by killing an Egyptian taskmaster. Moses (Amenemhet IV) had to flee to Midian where he remained in exile for 40 years. 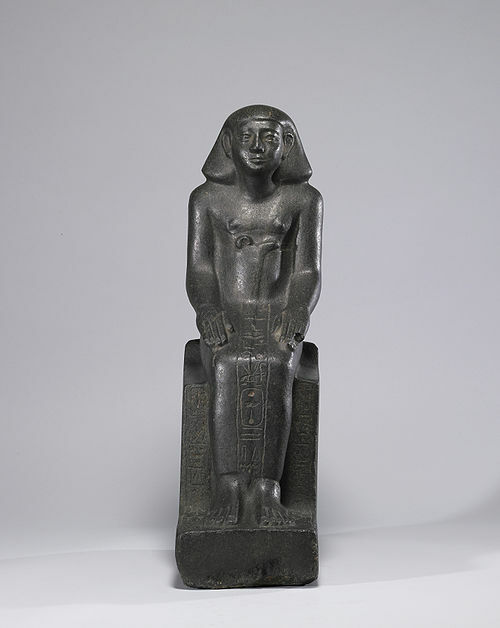 During this time, Amenemhet III died and his daughter Sobekneferu had to assume the throne. She only reigned for 4 yrs and then she died, so ending the 12th dynasty. The 13th dynasty is tradionally thought to have begun withSobekhetep I. It is often described as a time of chaos and disorder with a rather quick succession of pharaohs. Itj-tawy near the Faiyum was the center of government for most of the dynasty. Many of the Pharaohs were know only from an odd fragmentary inscription or from scarabs. Little is known about the chronology of this period as there were few monuments or stelas. Neferhotep Iwas one of the longest ruling pharaohs of that dynasty, reigning for 11 years according to the Turin King List. Neferhotep was the pharaoh who was ruling when Moses (Amenemhet IV) returned from exile in Midian, age 80 years, in 1446BC, to team up with his brother Aaron to deliver God’s message. There are numerous inscriptions in the Aswan region mentioning Neferhotep I’s name, as well as the names of family members and officials serving under this king. It is from these inscriptions that we know the name of his wife (Senebsen) and his son Haankhef and his daughter Kemi. Moses remained in exile for much of the 13th dynasty until the reign of Neferhotep I.
Flinders Petrie found a semetic workers village at Kahun which is situated close to Dashur and Hawara where many of the 12th dynasty mud brick pyramids are situated. Kahun was constructed during the time of Sesostris II to house the workers who built the pyramids at Dashur and Hawara. Scarabs found in the village indicate that it was occupied up until the time of Neferhotep I. As so many tools and manuscripts were left behind, Petrie concluded that the village must have been evacuated fairly quickly. The Hebrew slaves who lived in Kahun were given the task of making mudbricks containing straw for the Pharaohs of the 12th dynasty. The mudbricks were used to construct the cores of the 12th dynasty pyramids. There were at least seven pyramids constructed during the 12th dynasty which spanned about 200 years. The Labyrinth at Hawara, constructed under Amenemhet III, also contained millions of mudbricks. The Labyrinth contained over a thousand rooms and was considered one of the wonders of the ancient world. A large slave labour force was needed to support the building exploits of the 12th dynasty pharaohs. The Israelites had grown to number around 2 million. Even if the Israelites only produced one mud brick per day per person, there were more than enough Hebrew slaves in Egypt to meet the building needs of the 12th dynasty pharaohs. The Egyptions were worried that the Israelites may rebel and join their enemies. The pharaohs of the 12th dynasty oppressed the Hebrews, forcing them to be slaves. When Amenemhet III was co-reigning with his father Sesostris III, he tried to have the male babies of the Hebrew slaves killed. Moses was born during this time and was found and adopted by the princess Sobekneferu. She raised him as her own which means he would have been an heir to the throne because Amenemhet IIIhad no other male heirs and a women had never taken the throne before. It appears that Moses, as Amenemhet IV, helped Amenemhet III reign for about 9 years before having to go into exile. Sobekneferu did eventualy succeed Amenemhet III but only because Moses / Amenemhet IV had to flee to Midian after revealing his loyalty to the Hebrews. Moses / Amenemhet IV was 40 years old when he fled to Midian. Amenemhet IV had a coregency with Amenemhet III of 9 years according to the Turin King List but he never reigned by himself. Moses / Amenemhet IV remained in Midian for 40 years when had an encounter with God on Mt Sinai (the burning bush) and was told to return to Egypt and lead the Israelites out of Egypt to the Promised Land of Canaan. (Exodus 3:1-22 ) He also met his wifeZipporrah in Midian. Zipporrah was the daughter of the High Prist of Midian Jethro with whom Moses / Amenemhet IV stayed. The pharaohs of the 12th dynasty had forgotten what Joseph (Imhotep) had done for Egypt. The Israelites, who had come to number around 2 million posed a threat to the Egyptians and so the 12th dynasty pharaohs oppressed the Israelites and forced them to make mudbricks and work the fields. The 12th dynasty ended with the death of Sobekneferu; the princess that found Moses and raised him as her own. Moses and Aaron went before the Pharaoh (Neferhotep I) and presented the message that God had given them. Moses was 80 yrs old when he was sent to Pharaoh (Neferhotep I).Exodus 7:7 The Pharaoh’s heart was hard and so God had to inflict 10 plagues upon Egypt before the Pharaoh (Neferhotep I) would finally agree to let the Israelites go. Flinders Petrie found evidence to suggest that the town of Kahun was suddenly vacated. He also found the scarabs of various pharaohs including those of Sesostris II (the earliest) and Neferhotep I (the latest). The the most recent (latest) scarabs would indicate which pharaoh was ruling when the town was vacated, particularly if the pharaoh had been ruling for a while. The most recent scarabs found at Kahun were those of Neferhotep. Neferhotep also has the necessary credentials to be the Pharaoh of the Exodus in that he was reigning at the right time, his body (mummy) was never found and he had a son but his son did not succeed him. Neferehotep Iwas succeeded by his brother Sobekhotep IV who would not have normally been next in line to the throne but for the fact that Neferhotep’s firstborn son Haankhefwas killed in the last of the ten plagues that befell Egypt. The Israelites assembled at Succoth and headed towards Etham and the Red Sea thus avoiding Philistine territory.Exodus 13:17-22 Moses took Joseph‘s (Imhotep‘s) bones with him.Exodus 13:19 The Israelites were guided by a pillar of fire by night and pillar of cloud by day.Exodus 13:21-22 The Israelites camped at Etham on the edge of the desert.Exodus 13:20 Pharaoh (Neferhotep I) changed his mind and pursued the Israelites with his army and all of Egypt’s chariots.Exodus 14:1-31 The Israelites were able to miraculously cross the Red Sea on dry ground but Pharaoh (Neferhotep I) and his army were drowned when they tried to follow.Exodus 14:21-31 The mummy of Neferhotep has never been found. Egypt was crippled by the ten plagues and the Exodus. Egypt, not only lost it’s leader, it’s army and it’s transportation, it lost it’s slave labor force. Egypt was no longer able to undertake massive construction projects (eg the great pyramids and the Labyrinth). Egypt fell in to turmoil and became vulnerable to invasion by it’s neighbors. As the Israelites were leaving Egypt, they crossed paths with a tribe of nomadic herdsman called the Hyksos / Amalekites (‘Shepherd Kings’) originating in Arabia. They had a battle at Rephidim in which the Israelities prevailed. Some time later, the Hyksos arrived in Egypt and set up a fort at Avaris. 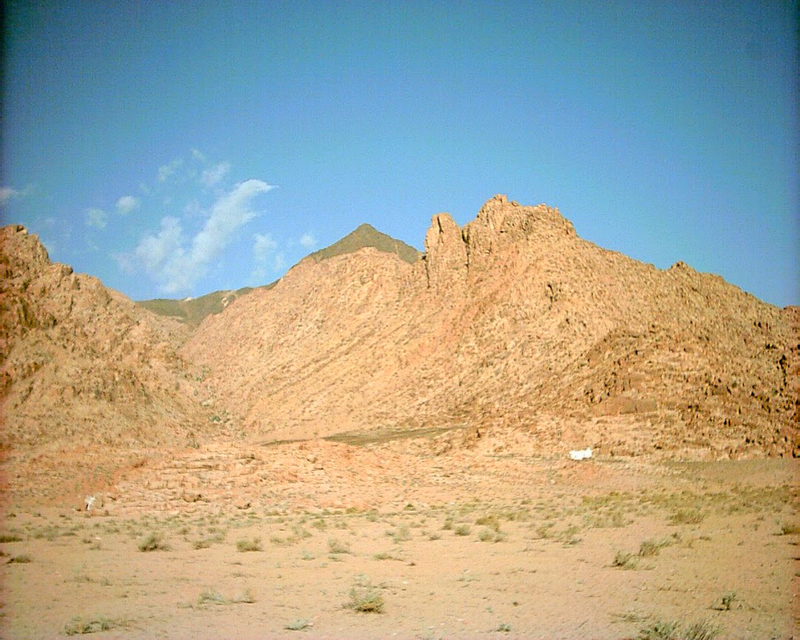 Meanwhile, the Israelites arrived at Mt Sinai in Arabia, where they camped for 40 years before proceeding to the Promised Land of Canaan. The Hyksos (Amalekites) established a base at Avaris from which they gradually subdued the rest of the country. They eventually took control of Lower Egypt (the 15th dynasty) where they demanded homage from the Kings of the south (the 17th dynasty in Upper Egypt). Eventually, Kahmose of the 17th dynasty in the south (Upper Egypt) lead an uprising that forced the Hyksos (Amalekites) to leave Egypt. About 400 years after the Exodus the Hyksos (Amalekites) were eventually driven out of Egypt by Kahmose only to bump into King Saul of Israel who almost completely wiped them out. Ahmose I, the brother of Kahmose became the first Pharaoh of Egypt’s New Kingdom which Manetho called the 18th dynasty. Exodus 12:33-39 The Israelites took unleavened bread and large droves of livestock with them. The Egyptians also gave them considerable amounts of silver and gold and clothings. Discovered by Ronn Wyatt in 1978. A pair of pillars on the Egyptian side (Nuweiba) and the Saudi side of the the Gulf of Aqaba – The Red Sea. The one on the Egyptian side had fallen over and was in the sea. It’s inscriptions had worn off. The one on the Saudi side was inscribed with the words: Yahweh, Pharaoh, Mizraim, Moses, Death, Water, Solomon, Edom. The Saudi pillar has been removed by the Saudi’s but the one on the Nuweiba side is still standing and can be visited. Wyatt also found 4, 6 and 8 spoked chariot wheels covered with coral strewn across the bottom of the Red Sea at this point. Solomon left stone pillars to mark the site of the Red Sea crossing. These pillars were found at Nuweiba by Ronn Wyatt in 1978. Earthquake epicenters in the latter half of the 20th century. Fault lines and tectonic plates of the Earth. What happens to tectonic plates during a volcanic eruption? Historical Landmarks in the Chronologies of Israel and Egypt and Mesopotamia.